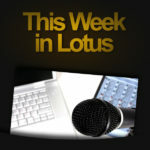 Welcome to the ‘This Week in Lotus’ podcast! Join Stuart McIntyre, Darren Duke, and other community luminaries in a weekly round-table discussion of all things Lotus. Recorded every Friday at 12pm GMT/7am ET and released on Sunday, we aim to cogitate, deliberate and confabulate on the latest news and trends in the Lotus community. Look out for our first episode very soon!